If you spend a lot of time in your vehicle and comfort and access are key considerations, you may want to find the best SUV with captain chairs. And there are a lot of choices out there, since the majority of larger SUVs and crossover utility vehicles (CUVs) have optional 7-passenger seating with captain chairs. So, how do you choose the right one? Here are three contenders. Chevrolet Traverse – U.S. News and World Report ranks the Chevrolet Traverse #1 in Affordable Midsize SUVs (although it’s actually a full-size SUV), praising it as “affordable, stylish and versatile minivan alternative” and a “great family SUV.” Traverse, Chevrolet’s first large SUV, even comes with standard third-row seating. Captain chairs are optional, bringing the total passenger count to seven with this configuration. Platform mates include the GMC Acadia, Buick Enclave and Saturn Outlook. 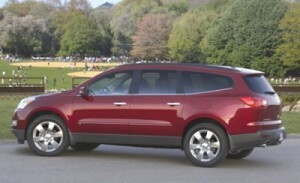 Some reviewers say Chevy Traverse is the best of the lot, offering a great price and, like its mates, comments Edmunds, “boasts greater amounts of passenger and cargo space than a traditional large SUV while also delivering a more pleasant carlike driving experience and superior fuel economy.” Cons include maneuverability, some visibility problems, and interior materials. Ford Flex – Introduced in 2009 and now in its second year of production, the Ford Flex midsize crossover wagon or SUV that seats seven in standard configuration and six with optional 2nd-row reclining captain chairs. Edmunds hails its “unique styling,” “high-quality cabin… refined ride, excellent safety scores, high-tech features,” while saying “transmission is reluctant to downshift” and there’s “less maximum cargo space than competing minivans and some crossovers.” About Flex roominess, the Detroit News says, “If you choose the optional captain chairs over the standard bench seat, you may lose space for one passenger, but did you really need it? You feel like Capt. Kirk in the second row of the Flex.” U.S. News and World Report ranks Flex #3 in Affordable Midsize SUVs. Cadillac Escalade – Ranked #1 in Luxury Large SUVs by U.S. News and World Report, the 2010 Cadillac Escalade “impresses with its luxurious cabin and old-school SUV capabilities.” Standard seating configuration is seven, with captain chairs in the front two rows and a bench third row. Edmunds editors offer high praise, saying “Stylish and powerful, the 2010 Cadillac Escalade ranks as one of the better full-size luxury SUVs on the market.” Edmunds adds the luxury SUV has a “gutsy V8,” “classy looks inside and out, long list of desirable standard features,” but knocks third-row legroom, braking distance and fuel economy. Other possibilities for best SUV with captain chairs include the GMC Acadia, Buick Enclave, Ford Expedition, Lincoln Navigator, and Saturn Outlook.